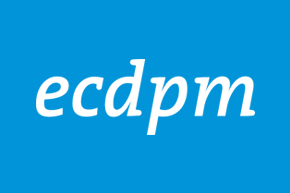 ECDPMGreat Insights magazinePolicy coherence across the food system for nutrition: from challenge to opportunity? Policy coherence across the food system for nutrition: from challenge to opportunity? Hawkes, C. Policy coherence across the food system for nutrition: From challenge to opportunity? GREAT Insights Magazine - Volume 6, Issue 4. September/October 2017. Policy coherence occurs when policy actions across sectors and stakeholders are actively aligned towards meeting agreed objectives. Policies that affect the food system are currently not aligned towards improved nutrition outcomes. Yet there are opportunities for greater coherence. Identifying priorities for action will require careful analysis. As soon as we start thinking about how to create greater policy coherence in the food system, we have to ask: “coherence for what?” and “coherence with what?” “For what” is all about what we want the food system to do: deliver enough food; make healthy diets available and affordable; provide decent jobs; protect the planet; and nurture social cohesion, all while supporting economic development, equitably. “Coherence with what” is about whether policies designed to improve one or another of these objectives also supports – or at least does not harm – the pursuit of other objectives. In other words, policy coherence is about ensuring that policies aiming to improve one outcome of the food system do not undermine others. The goal is to reduce inefficiencies and outright conflicts between different goals and identify where there are synergies for mutual benefit. 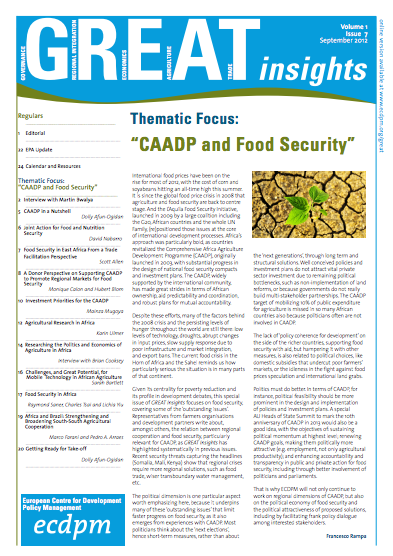 A policy coherence perspective means asking: How can we achieve different food system objectives synergistically? A starting point is to take one policy objective and assess whether policies affecting the food system are coherent with it. Let’s take the case of nutrition. As reported in the Global Nutrition Report 2016, millions of people are too thin, do not grow properly, carry excess weight, or experience debilitating disorders and diseases as a result of inadequate and imbalanced diets. 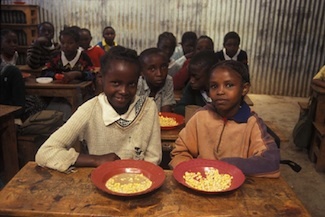 The good news is that improving nutrition is now on the agenda of many governments around the world. The 2015 Sustainable Development Goals include targets on ending hunger and malnutrition in all its forms, as well as health goals influenced by what we eat, including non-communicable chronic diseases. The world would undoubtedly benefit from diets that promote health for all – diets which are safe, diverse, nutritious, and low in foods that offer no health benefits. The question is: are the policies that affect food systems coherent with this objective? As soon as we delve into the policies of the food system, we see a space riven with incoherence between differing policy objectives. For example, international agencies and governments have all agreed that boosting fruit and vegetable intake is critical to achieving health objectives. Yet as noted by the report Food Systems and Diets published by the Global Panel on Food Systems for Agriculture and Nutrition in 2016, public investment into agricultural research is largely driven by the objective of producing enough food and thus allocated to a small number of cereals, not fruits and vegetables. A recent report by the NGO Hivos and the think tank the International Institute for Environment and Development, highlights the incoherence between policies that create incentives for the production of certain foods at the expense of others. 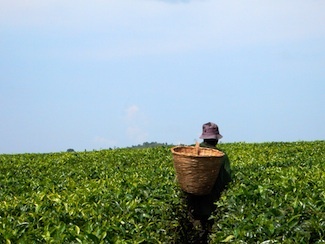 The report Agriculture, Food systems, Diets and Nutrition in Zambia, shows that government spending on agriculture is heavily skewed towards maize production–with the goal of producing enough food–and yet evidence shows this is inconsistent with diverse diets and does not benefit the most vulnerable households. An oft-cited example is that of palm oil, the world’s most produced edible oil. International institutions and governments, notably in South East Asia, have historically used public investment and policy measures to create conditions that enable greater production of palm oil. The goal here is economic development and jobs to reduce poverty. Yet there is a conflicting dietary objective of reducing consumption of saturated fats, and a conflicting environmental objective of protecting forests and the animals who live in them. Inconsistencies cross international borders too. An action plan released by the UK government in 2016 with the goal of boosting the economic benefits of food exports, raises questions about why they are promoting exports of cookies, confectionary, snacks and meat when UK dietary guidelines recommend eating less of these foods. Work I have done with colleagues shows that trade liberalisation policies designed to boost national and global economic growth have made it easier to import, produce and advertise fast food, snacks and soda. Policies designed to support mass production of meat are inconsistent with global efforts to reduce greenhouse gas emissions. Constructively addressing these inconsistencies requires careful analysis. Some solutions appearing intuitive would in fact be inadequate on their own or, worse, counterproductive. 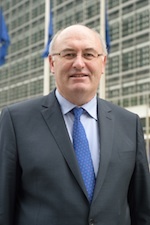 What, for example, is the use of pouring agricultural research investment into fruits and vegetables if the only beneficiaries are wealthy western consumers in search of a crunchier form of broccoli, juice manufacturers pulping the uneaten results, or supermarkets full of fruit with a long shelf life but lacking in taste? What would be the point of acting in one country to make palm oil production more sustainable or switching to alternative oils if production simply increases in another? Why bother to shift from maize to more diverse crops if there is no infrastructure in place to get these products to markets serving the underserved? Fixing incoherence for nutrition will clearly only be effective if analysis considers alignment from fork to farm. It is undoubtedly a complex business: there is a lot of policy in the food system – some of these policies are implemented to achieve food systems goals; many have other objectives – such as transport policy or urban planning – but nevertheless have major impacts on the food system. Incoherence does not necessarily mean that individual policy objectives are not legitimate. Analysis should recognise the need for different goals while bringing conflicts out into the open and creating a space for a conversation about if and how they can be reconciled. The relationship between public policy and the private sector is key. For when we look at policy incoherence, it becomes evident that while we are talking about public policy, its outcomes are influenced by the private sector who delivers our food, from the independent farmer to the vast corporation. This means we need to look carefully at how different private sector enterprises respond to policy: are they undermining policy objectives, or supporting them? Is the private sector making it harder or easier for the public sector to do the right thing? Is the public sector doing enough to create an enabling environment for the private sector to achieve positive food system objectives? Finally, there is the question of implementation and impact. A project I am involved in on policy coherence for fruits and vegetables in Argentina is finding that the biggest coherence gap is between policies on paper and delivery of those policies. One of my Food Policy Masters students is doing a coherence analysis between government policies and the Mediterranean diet in Spain, finding there can be coherent policies on paper, but lack of specificity of objectives means it is hard to analyse what impact they might have in practice. The Centre for Food Policy’s own incipient analysis of the implications of “Brexit” has shown clearly that starting the process by looking at the vast scope of EU food law is not the way to go unless we know what outcomes it actually has. Careful analysis should take into account whether policies are actually implemented and if so, what outcomes they have in practice. We need tools to analyse coherence between food systems policies and nutrition – along with other food systems goals – that start with the dietary problem at hand. By starting with a problem and working backwards into the food system, we can trace how policies play out in practice and influence the nutritional outcome, from fork to farm. It’s a way of avoiding getting lost in the complexity and ending up with an analysis that looks good on paper but has little relation to what is actually happening in the messiness of the food system and little connection to the real causes of the nutritional problem. There is surprisingly little good policy coherence analysis out there. Much work is still needed to develop clear methods of doing so. This means we are missing opportunities to improve nutrition and other food systems goals. The presence of a target on Enhancing Policy Coherence for Development in the Sustainable Development Goals presents such an opportunity. For example, the Organization for Economic Cooperation and Development has developed a policy coherence tool in the context of the SDGs; the World Health Organization is convening a global conference on enhancing policy coherence for non-communicable diseases in October 2017. It is now time for careful analysis of opportunities for policy coherence for nutrition – along with other food system goals. It is desperately needed to enhance the effectiveness and efficiency of all the many actions currently being taken to fix the global food system. 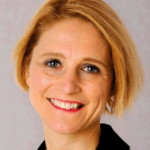 Professor Corinna Hawkes is Director at the Centre for Food Policy, City University of London, UK, a centre dedicated towards advancing a more integrated and inclusive approach to food policy through education, research and engagement with the world of food policy. She is also Co-Chair of the Independent Expert Group of the Global Nutrition Report. 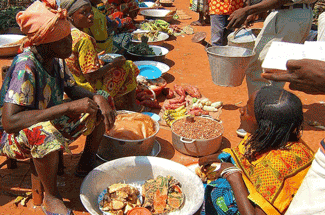 Photo: Market in Zemio. Credits: Teseum via Flickr.